Located in a stunning and natural setting between the towns of Alhaurin de La Torre and Alhaurín el Grande, Lauro Golf has become a favourite for those looking to play golf here on the Costa del Sol, Spain. But why is Lauro Golf one of the most popular destinations for our golfers and what is it about Lauro Golf that draws them back year after year? That’s right. Lauro offers 27 holes of golfing splendour offering you three different combinations of 18 holes, all of which have a par 72. The course was originally designed and built by the late Falco Nardi in the early 90’s who sought to insure that the course was challenging enough to make club selection the prerequisite, but at the same time, not to make it so challenging that golfers of all abilities couldn’t enjoy it. You’ll also be pleased to know that the Lauro golf course is fairly flat and that a buggy isn’t necessary although you may need a rubber dingy to help you navigate the nine lakes that feature throughout the course! 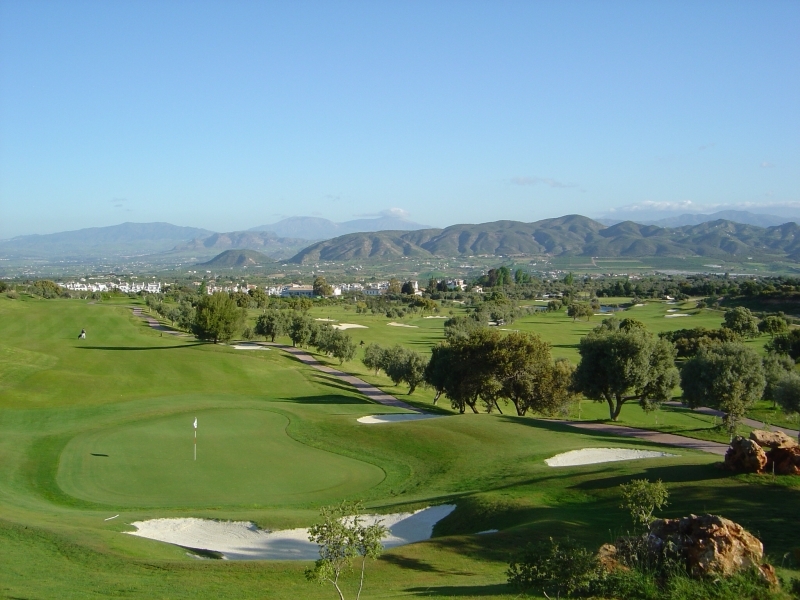 The course is set in the Guadalhorce Valley and sits in a spectacular natural setting. The course was originally built on a large estate of fruit and olive trees, many of which are still present today. For nature lovers, the course offers an abundance of wildlife including rabbits, partridges, ducks, herons and even eagles (no pun intended). The views of the surrounding Mijas mountains and the Mediterranean are simply stunning and are a sight to behold. You will most definitely want to take a snap or two from your phone to show the folks back home! The Lauro course not only offers a splendid golfing experience, there are also a multitude of other facilities available for you to use while here. For example, why not practice your swing and have a golf lesson or two before you tee off? The Lauro Golf Academy offers a practice driving range, putting green and professional golf tuition from some of the regions best pro golfers. That’s got to be worth at least a couple of shots off of your handicap! If for some reason you are looking for a break from the golf, you may want to enjoy some of the other sporting activities that Lauro has to offer. You’ll find a lot on offer including padel tennis, lawn bowls, an equestrian centre with horse riding and lessons, swimming pools and a lot more. Or why not get your credit card out, head to the pro-shop and treat yourself to that lovely new driver you’ve been promising yourself. Go on, you know you deserve it!! At the very heart of the Lauro Golf complex you will find the cortijo style clubhouse. Here you will find the ‘Casa Club’ restaurant with its friendly and relaxing atmosphere, which is a popular meeting point for local golfers and non-golfers alike. The restaurant offers a first class selection of food, from early morning breakfast to get you started before your round or sandwiches and salads for a lunchtime treat. Next door, you will find the ‘La Risa Bar’ where you will be served high-quality fresh daily food which you can enjoy along with a refreshing drink or two. La Risa offers some delicious dishes including all of your favourites from home including beer battered fish and chips, chicken curry, poached salmon, beef burgers and chicken and mushroom pies. Yummy! Lauro Golf Residential overlooks the stunning Guadalhorce Valley and is the perfect location for those wishing to enjoy everything Lauro Golf has to offer. Lauro Golf Residential is comprised of a number of self catering apartments that can accommodate anything from two to six people. Due to its prime location, Lauro Golf is just 10 km from the nearest beach and 12 km to Malaga international airport. It’s also just a few minutes drive to the popular neighbouring town of Alhaurin el Grande well you will find plenty of shops, bars and restaurants. Finally, a little bit about ourselves here at Golf Breaks In Spain. Golf Breaks In Spain have been offering golfing breaks here in Spain since 1997 and since then have had the pleasure in catering for over 20,000 golfers. You can view all of our current golf offers via the special offers page. So there you are. 8 great reasons why Lauro Golf could be your next golfing destination, here on Spain’s sunny Costa del Sol.